Ireland captain Jamie Heaslip admitted it was a relief to bounce back from last week’s defeat with a comprehensive 63-10 win over Italy in Rome. 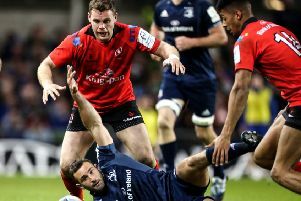 CJ Sander scored a hat-trick, while Craig Gilroy also ran in three as a substitute as Ireland recorded the first try-scoring bonus point in the history of the Six Nations in a dominant performance. It followed on from a disappointing opening day defeat to Scotland, where Ireland lost out narrowly in an entertaining tie with Scotland. The number eight, who skippered Ireland against Italy after Rory Best was ruled out with illness, said his side were flattered by the scoreline but was happy with how they recovered from last week. “The final score put a nice shine on it,” he told ITV. “We got a few lucky bounces but worked a lot of scores. “We were a lot more clinical, we were a bit loose at times last week, but we showed in that second half what we can do. He added: “It’s nicer to win than lose. Everyone on that field is a competitor. “We are delighted with the score and especially the second half. Italy really challenged us at times. Head coach Joe Schmidt was pleased with the character shown by his players after the disappointment of last week. “We showed we can start well and that gives a platform to build on,” he said. “The players felt that (they needed to make a statement). We know how good they can be.